I am slowly, surely, finally working towards the opening of my Etsy shop. Now that we are moved and relatively settled and the blur of the past year is settling into some kind of calm, I’m getting myself into a schedule of work so that production is happening on a regular basis. Then to apply for craft fairs. Then to take over the world one burp pad at a time, ha! It’s anticipated change, terrifying, procrastination-inducing and new. Time at last to dig in. 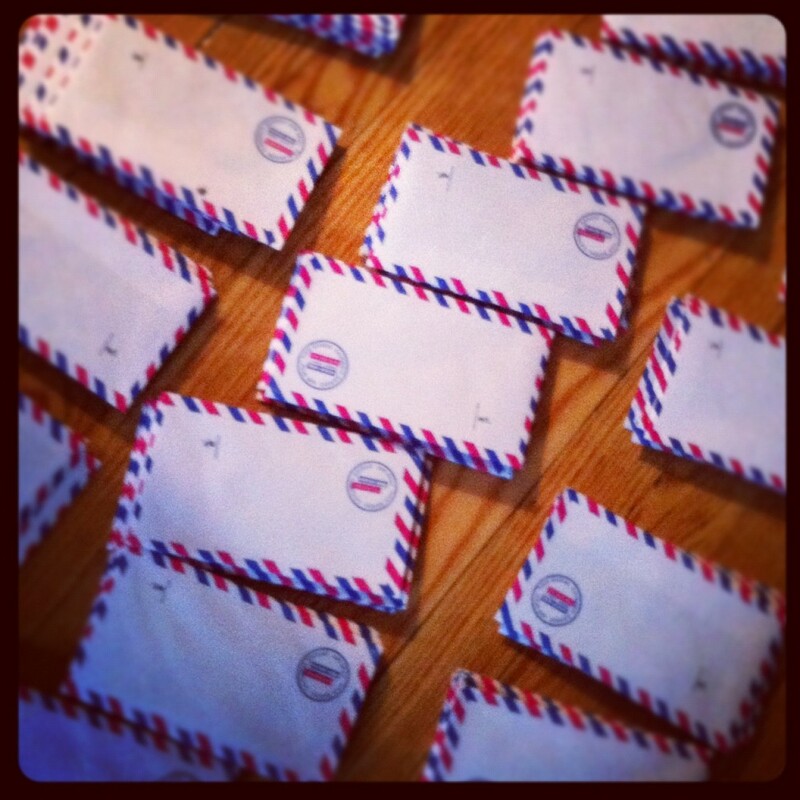 And part of that prep is tagging and labelling, so I ordered my first-ever product labels. 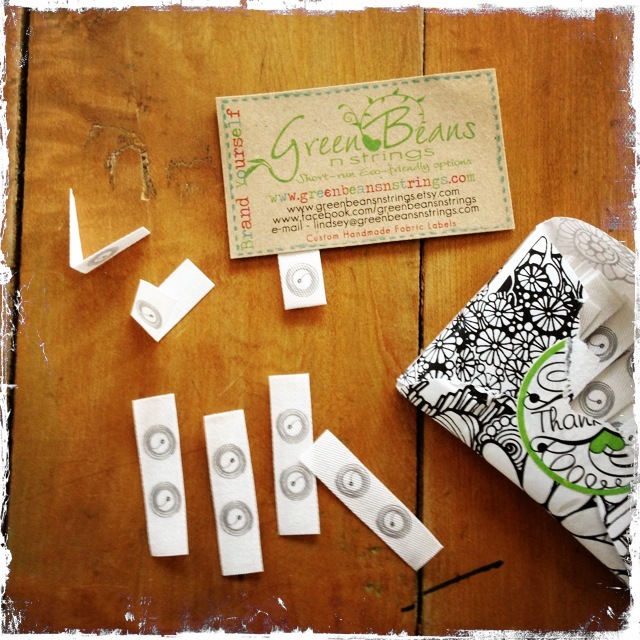 Lovely, half-inch cotton twill fold-over labels with my round pocket-watch-ish spiral logo. Went without words to keep it small. Which might end up being a rookie marketing mistake, but I just like them so much as they are, simple. But I was torn, maybe I’ll try the whole worded Pocket Alchemy logo next time. Opinions about and experiences with labelling are most welcome, please. I don’t often post about cooking or baking, because while I an a tolerably good cook and a moderately successful baker, I am not exceptional. I’m too busy crafting and choreographing! However, I signed up for Rudi’s school bake sale. I said I wouldn’t, trying to dial down the volunteering in order to focus on my own work, but then he filled in the form himself with mystery 4-year-old letters and I felt bad returning it without being a joiner. What to make? Well, I thought I’d try chocolate quinoa brownies I’d seen on the PC site! A lot of the comments said that they were too wet so I immediately added some psyllium and flax to mine to bulk them up. Plus Rudi can always use a bit of extra fibre (can’t we all?!). And I thought I might as well try adding some vegetable-matter as well, in a for a penny, in for a pound. They turned out great! 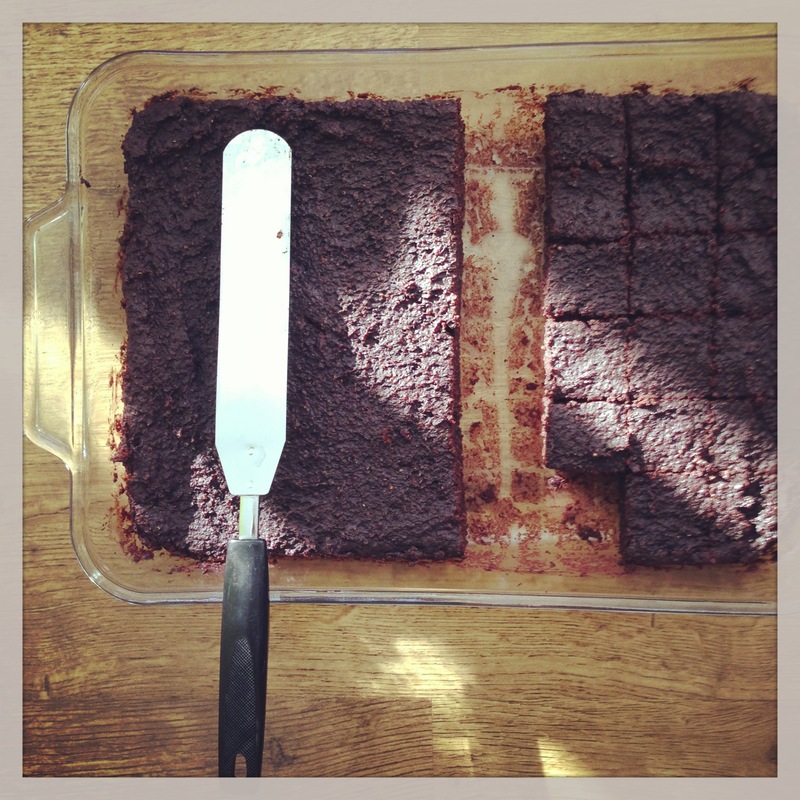 They’re lighter in texture than a standard brownie but quite satisfying. I’ve made them a few times now and always play with the veggie/fruit content depending on what I have lying around. Honestly, they’re not Rudi’s favourite. He’ll eat ’em sometimes but doesn’t adore them. However, adults seen to LOVE them! A bunch of the staff at his school all wanted the recipe (so now I’m a popular mom, operation-joiner was a success!) and when I typed it up I thought I might as well share it here too. So enjoy, play with it, tell me if your kids actually ends up loving them … if they don’t I’m pretty sure you will! Happy Valentine’s Day! Yes, the big V day is here and I do so love to embrace the day of love, not so much in the couple-y sense, but in the wider, appreciating the people and things around me sort of a way. And it inspires all sorts of craftiness in people far and wide, which is so excellent! 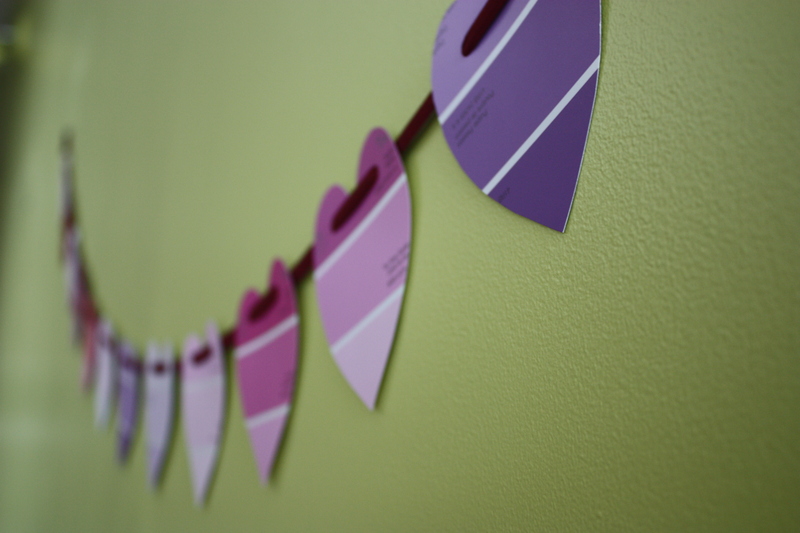 I, along with the rest of the crafty world, have fallen for buntings in the past couple of years and envisioned this one just last week while standing in front of the paint samples at Rona. Didn’t know if I’d have time to make it happen but I squeezed it in, threading hearts in the driveway while my sons pretended to drive in my stationary car (side note/free parenting tip: this is an excellent way to buy some time, just let them sit in the driver’s seat and go go go til they’re spent. If the horn honks, it just spices up the neighbourhood). My husband brought in a couple of snowy, errant hearts that I’d dropped when he came home later, hazards of crafting on the go. 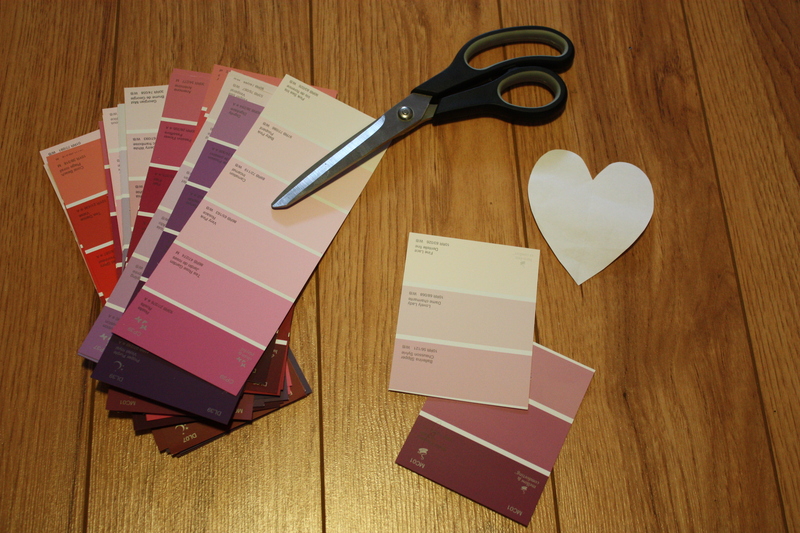 I adore paint samples. The the graduation in colour, the heavy texture of the paper, the free-ness, the often-ridiculous commercial names of the colours. 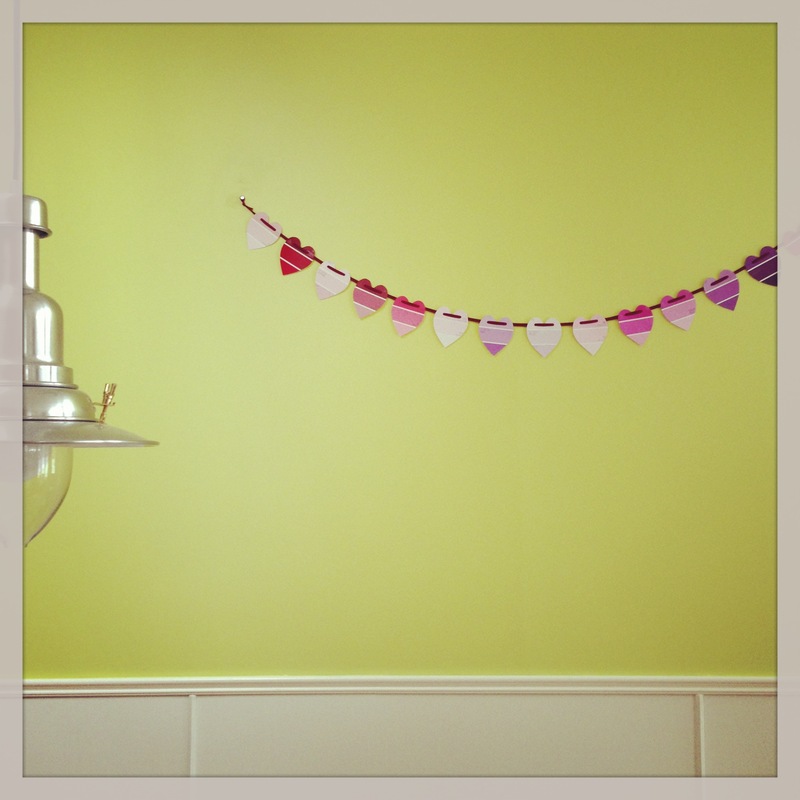 Here are some good ones from this bunting: Irish Rose, Grape Vineyard (is there any other kind?! ), Satin Serenade, Ballerina Slipper (waaaay off, much darker than an actual ballerina), Very Pink (in case of confusion), Grape Jamboree, Vintage Violet (exactly as you’d imagine), Strawberry Crush, Frankly Scarlet (could you settle for any other red after reading that? ), Valhalla (Norse gods always make me think violent fuchsia, of course they do! ), Canterbury Lane, Peppermint Pink (nice contrast in terms), Redfeather, Purple Polka (I’d take that dance), Vibrato, Regal Robe (just to end on operatic notes). Names aside, I simply find paint samples satisfying to look at. Plus they are a great, free art/crafting resource. One that I take liberal advantage of. 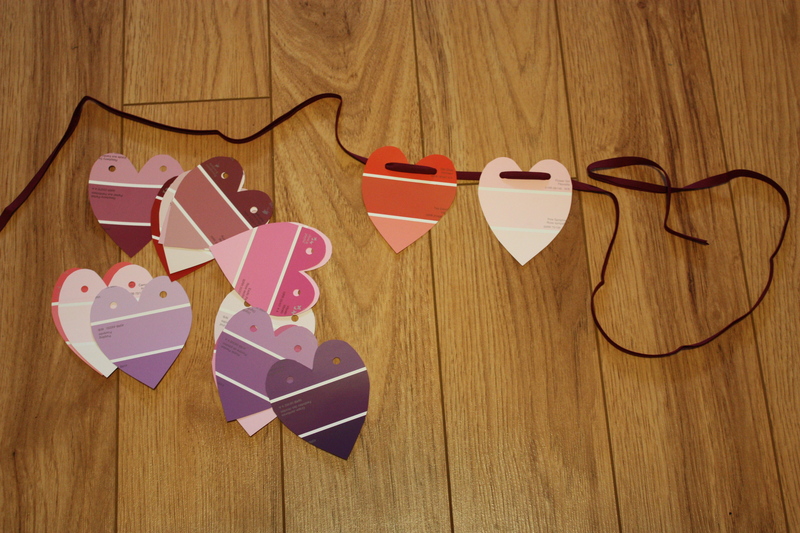 3: cut out a lot of hearts! With Rudi in his first year of school, sharing Valentine cards en mass is suddenly an important issue in our household! 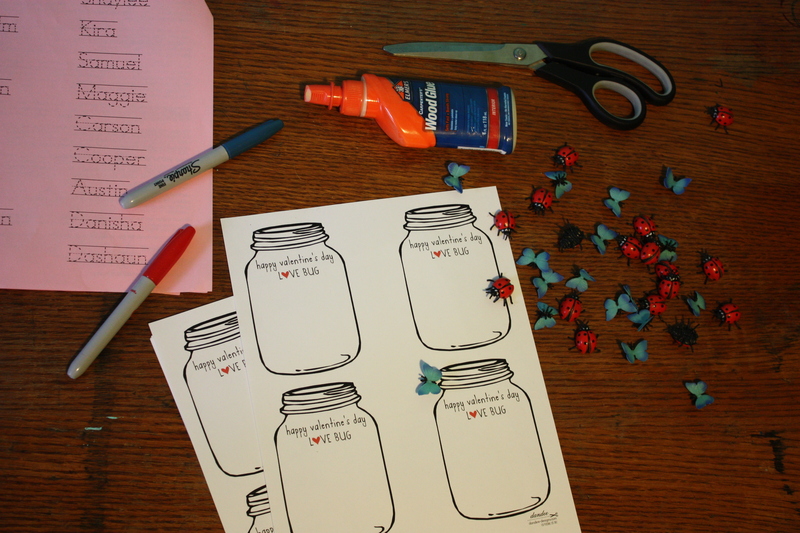 I took to the internet searching for a non-commercial, non-saccharine option and I found this wonderful Love Bug Jar idea from Danyelle at Dandee Designs, who generously shared her template with the world (I highly recommend checking it out immediately). Rudi is very excited about writing, he can make most letters, uppercase and lower, from memory when I recite them out loud to him in the order of a name, which totally, utterly astounds me. Such fast learning. Oh to be four! 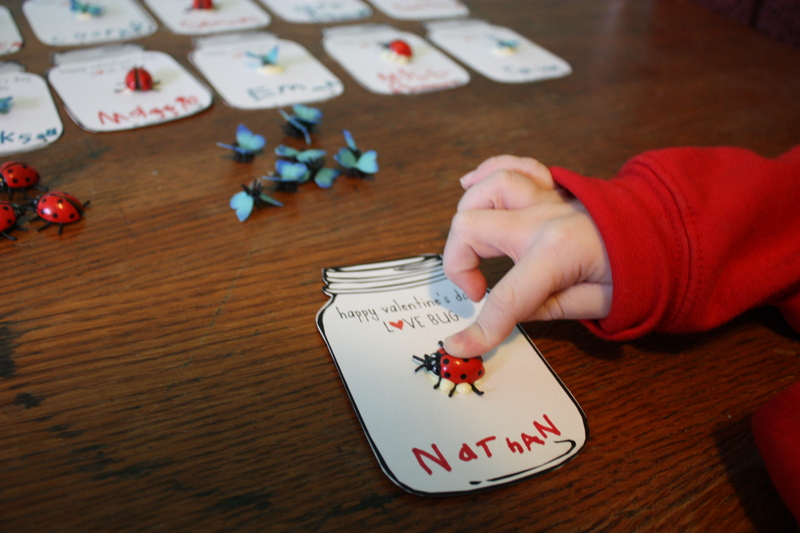 He was very taken with the bug idea but didn’t want any “creepy” bugs, so we went with butterflies and ladybugs. 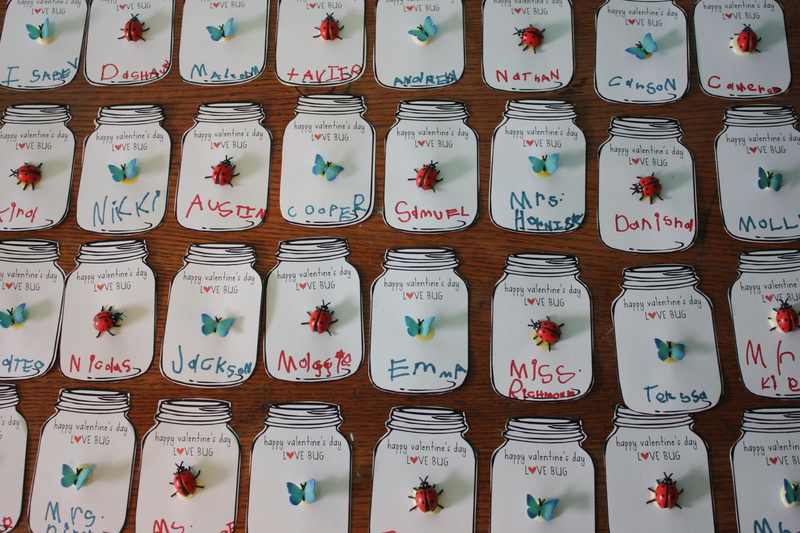 He toiled away, writing his name on the back of each jar (after a love from by me because he declared that to be “too many words for a boy to write.”) and wrote the recipient names on every single jar card in just two sittings. So proud I have a major crafty-boy with super-craft-stamina on my hands! He loved the glueing. I accidentally used wood glue that I thought was craft glue so it looks yellow — I guess that can be the creepy bit on these cards, and Rudi doesn’t care! I’d put a dot of glue down and he’d carefully place the bug, deciding out-loud which way it should face. 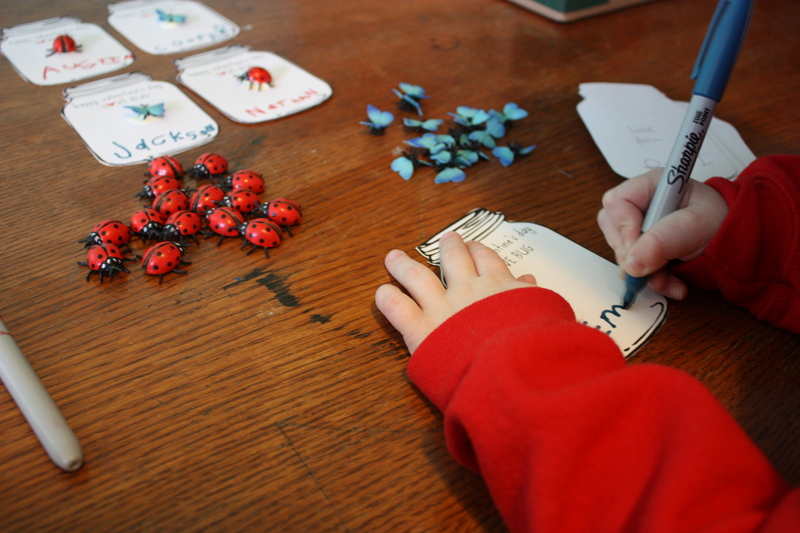 He also decided we should use the same ink as colour of bug. I’d suggested opposite colours but he said, “same would be better for sure.” Fair enough! 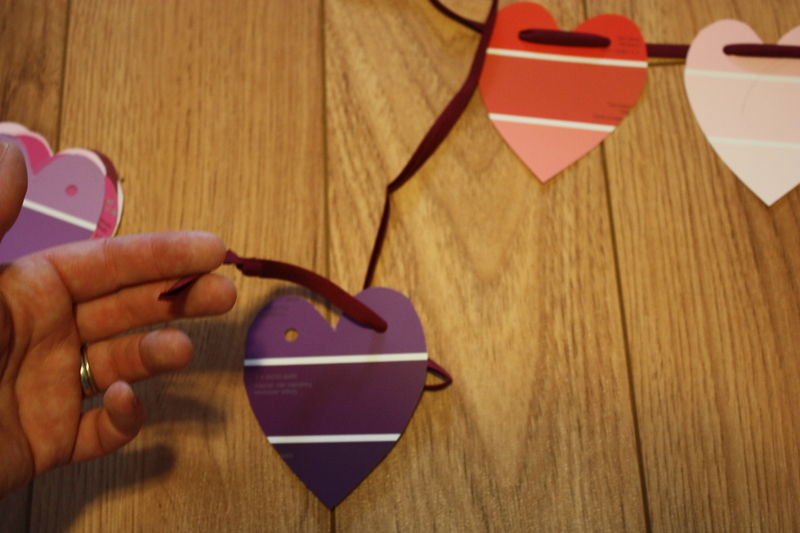 Ta-da — heaps of wonderful valentines for the class, now we’re working on more for cousins and friends.